If you find your fences, flower bed and random spots in your yard are being dug up by your dog, then you may need these Dog Training Tips To Stop Your Dog From Digging. While it may be a natural thing for them to do, it can also be very destructive to your property. These tips can help change your dogs behavior and keep those holes from becoming an issue. Add More Exercise: Often dogs dig out of boredom or need for more activity. Make sure you are not only taking your dogs for walks, but engaging them in routine activity. Running, chasing balls or Frisbee (read how you can train your dog to catch a frisbee) and other active play is crucial for a dog. Without routine play they will easily become bored and seek other actions to occupy their energy. Block Their Digging: If they are digging at the same location over and over again, it may be best to block their actions. Blocks, rocks, a different type of fence or even different plants or shrubs can change the environment enough to deter your pet from digging there any longer. Get Rid Of Pests Or Prey They May Be Hunting: If you have a rat, squirrel, ground hog or other pest issue in your yard, the dog may be actually going after them and not just digging out of frustration or boredom. Work on eliminating pests that may be attracting their attention. This can quickly and easily stop their digging issue. Show Positive Attention: Sometimes dogs do dig to get your attention. They may want to show you their skill, or perhaps they are angry with you for not paying attention to them. Positive attention can do a lot for keeping the from digging. Playtime, snuggles, hugs, pats on the back, ear scratches and simple things like brushing them or letting them sit next to you will show them that you feel they are valuable to. A dog that digs is not a bad dog. Using these dog training tips to stop your dog from digging will go a long way toward keeping your yard pretty, and your pets happy. Positive reinforcement, a few minor changes and understanding why they are digging will help you solve this problem quickly and easily. Follow our tips, and look into training classes for our dog to create a healthier and happier family unit. 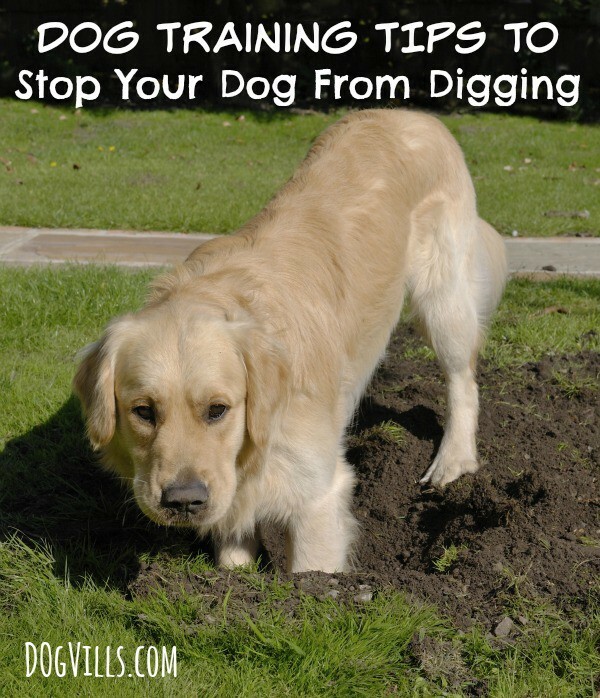 Do you have any dog training tips to stop your dog from digging? Share them in the comments!